Getting your water heated by the sun instead of having to pay for this necessity (electric or gas) is close to perfect as far as energy consumption is concerned, especially considering the high percentage water heating contributes to your energy bill. 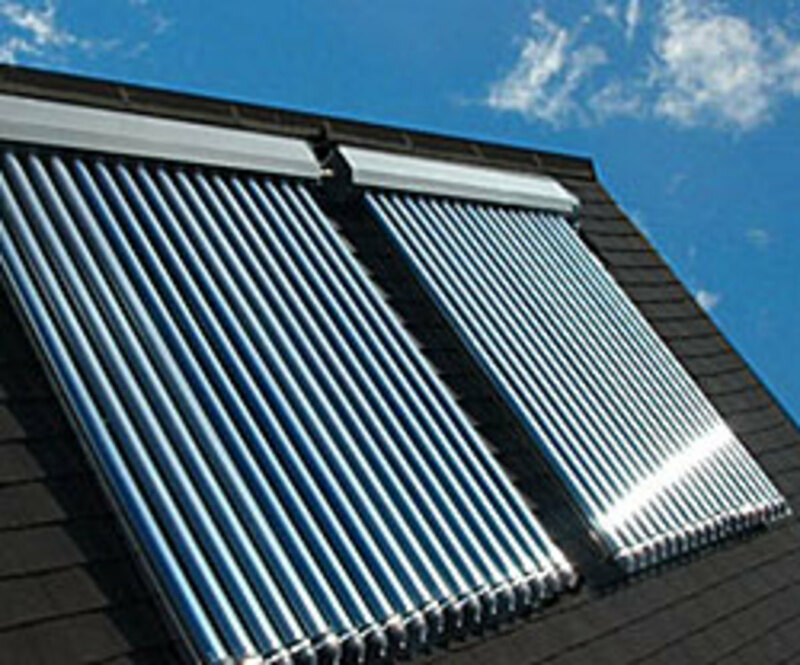 The one drawback of solar water heating is the fact that the sun is not always available (overcast and rainy conditions) to do this job and that the system is not, generally speaking, that effective in winter. This means that there will not be any hot water or the water will not be hot enough on certain times. This is where we then fall back on the back-up system, either an electric element or a gas unit, to get our water warm. 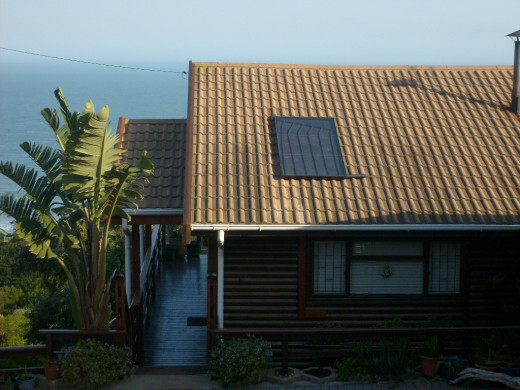 In South Africa, where I stay, a solar–gas hybrid hot water system is not readily available; all hybrid hot water systems are solar-electric and this is not ideal at all. In addition to the ever-rising price of electricity, we have an energy supply problem and outages or load-shedding occur from time to time during peak electric consumption periods (06h00 to 09h00 in the morning and 17h00 to 21h00 at night). Unfortunately, these are the times when people tend to do their bathing or take showers. We also have a system that electric hot water systems can be switched off remotely by the only utility we have (to help control electricity consumption during peak hours and thus prevent outages or regional load shedding), so whether electricity is available or not, you might end up not having hot water in any case. I dealt with the problem in the following way. My system consists of a storage tank of 200 liters, a solar panel, an electric element and a wood burning stove. In high summer the solar panel does all the work and heats the water to 55+ deg. C (131+ F) , which is more than enough for whatever we need it for. 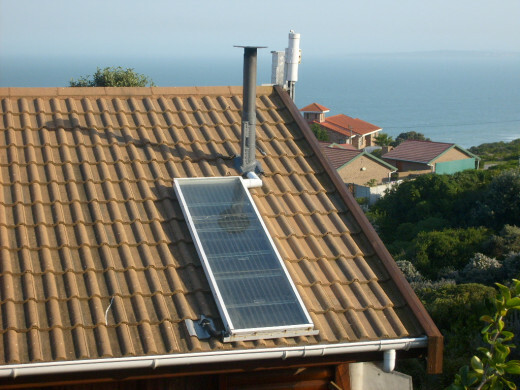 In winter the solar panel is not effective enough to heat the water sufficiently all the time. 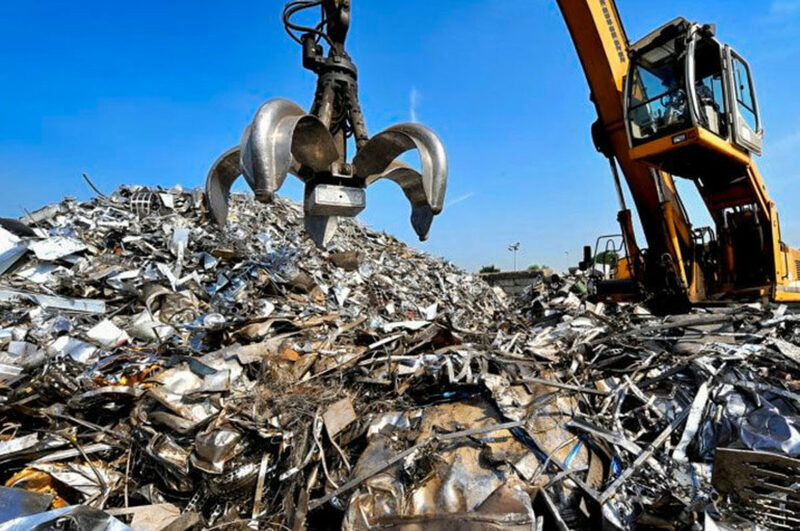 Take a good look at the image below and spot the LPG gas bottle, a plough-share an a car wheel rim !!! You will also see three pipes (one 32 mm and two of 15 mm) which run inside this stove and chimney and feed hot water back into the storage tank. It has a door (with a latch) which has been opened to show the pipes inside the stove. 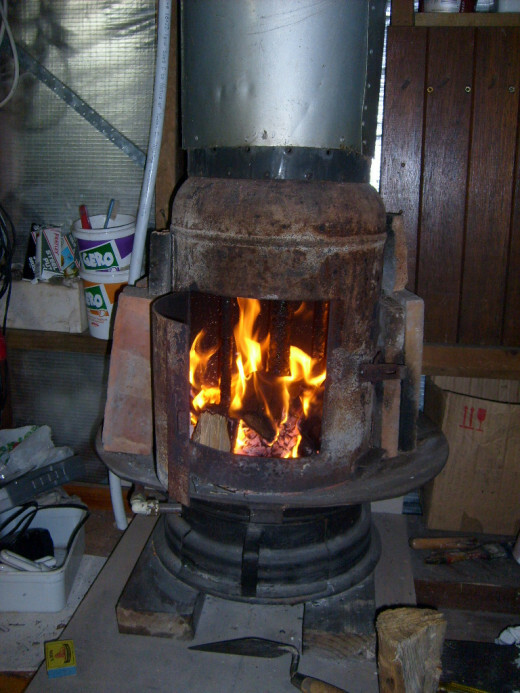 So, when the solar panel on the roof does not supply enough hot water to the storage tank, I simply make a small fire in the little stove and in no time we have hot water! It has never been necessary to fall back on the electric element to heat the water, but it is still handy to have that option as well. This little stove is so effective, that paper, cardboard and twigs and dry sticks from our garden are quite sufficient to do the job. 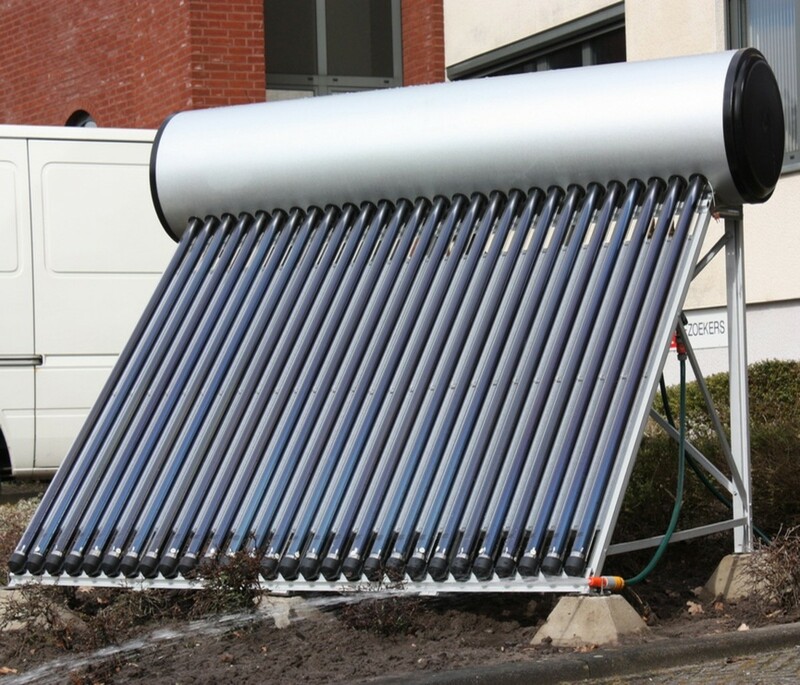 You could take a short-cut and buy a complete hybrid solar water heater kit at Amazon. Depending on your situation and how much you are willing to spend, you have the option of choosing kits with two, three, four, five, six, seven or eight panels, with everything else you need to integrate it with your existing system included. The prices at Amazon are very competitive. In addition to the three-way hybrid hot water system described above, I also built a small pure solar water heater in particular for the kitchen (see image of solar panel below). Since we need really hot water in the kitchen, this system has a storage tank of only 50 liters (13 US gal. ), but an absorber panel of 1.8 sq. m. (19.34 sq. ft.), which is relatively big for such a small storage tank). It generates very hot water in summer – up to 70 deg. C ( 158 F)- exactly what is needed when washing dishes. The inlet to this system is connected to the 200 liters hybrid system discussed above, meaning that water drawn from it is replaced not by cold water, but by hot water from the three-way hybrid system. This means that it is virtually an extension of the 200 liters system, ensuring that there will always be hot water available from this one. Since my DIY hot water system is a low-pressure one, I decided to separate the plumbing for this system from the original high-pressure one. This means that a complete parallel set of pipes and taps had to be installed, which in the end turned out to be right decision. The image down below is of the shower in one of the bathrooms. 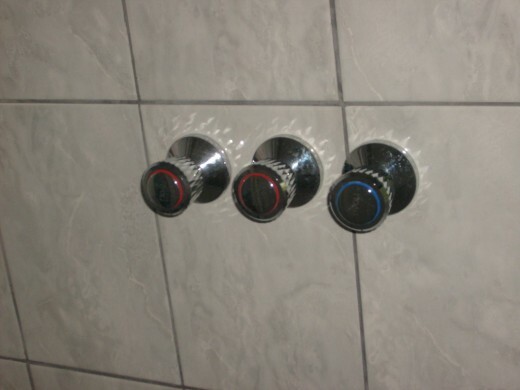 The tap in the middle is the solar one. 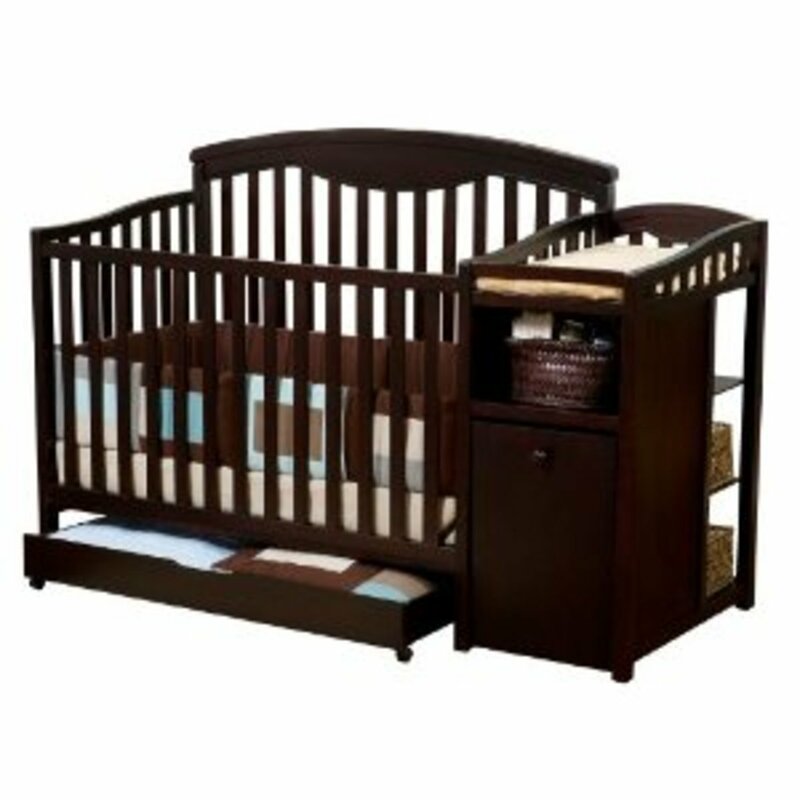 This system is a complete hybrid system, as the one I have described above. 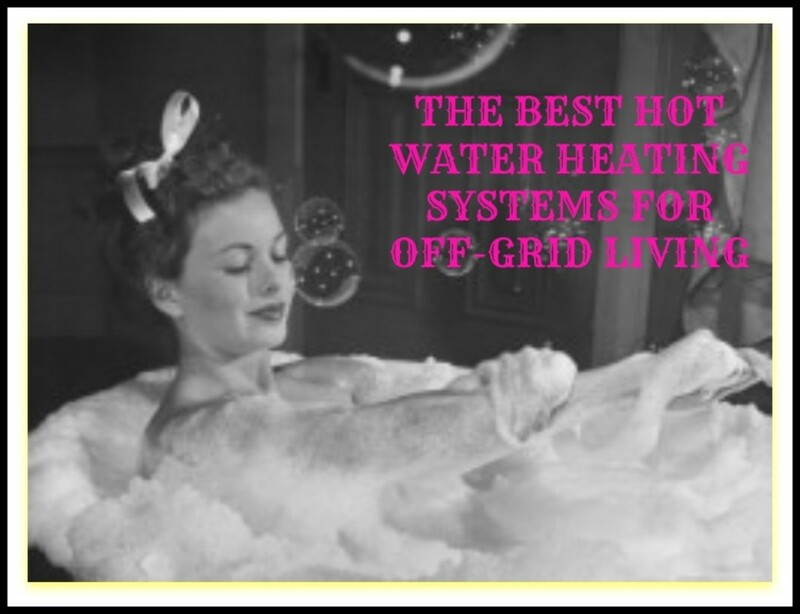 It links to your existing electric or gas water heater, so you will never have to worry about hot water at all. Installing this system you will have complete peace of mind as far as hot water is concerned.